A woman (pictured) practising the fine art of sewing - she must be careful with the needle lest she prick her finger and connect her digit with the coat, fusing them for life. Sewing is the art of fusing separate objects, usually sections of fabric, burnt-through upholstery, or metal, together through use of intertwining stitches. It is generally employed as a manner of constructing clothing, more commonly known as that stuff that guy down the street keeps getting arrested for not wearing, but serves various other uses as well, such as holding together old cars and keeping crazy women locked in the attic occupied from doing anything else. Until recently, all sewing was done by hand, but that all changed with the invention of the sewing machine along with the industrialisation of the rest of the modern world. Because of this, the durability and production capability of sewing spread as quickly as the subsequent laziness, enabling engineers to utilise sewing for many new applications, most of which remain completely ignored by the greater public. Despite the versatility of this innovation, sewing has dwindled in popularity in modern times, oft discarded in favour of faster techniques such as buckling, velcroing, zipping, taping, or even gluing component pieces together. Sewing has deep origins, dating back to the Palaeolithic era when Stone Age people began to sew together rocks and bones to form makeshift structures, some of the remains of which still survive to this day. When some attempted to sew together animals, it paved the way for the first successful attempts to domesticate livestock. Pieces of armour has also been found, dispelling the notion that the Medieval Europeans were the first to sew together armour. With the spread of these people across the face of the Earth, it seems all but inevitable that the practice of sewing should pass down to their descendants. And so it did, becoming particularly prominent with the rise of the Roman Empire. Bits of broken Roman vases have been found sewn together in excavation sites near Naples, Italy, and as a cornerstone of Ancient Roman practical repair, sewing was spread across Europe along with the Roman baths, Roman straight roads and Roman retirement promotion packages to the beaches of Nice. In Southern France, skeletons dating from between 100 B.C. and 50 B.C. had bones that were sewn together following accidents in the typical Gaulish hamlet. Hadrian's Wall was also regularly darned from time to time following Pict invasions that attempted to prise at the seams. Even the Colosseum in Rome was originally knitted together before it became the ruin it is today. Fashionable stitched armour, this suit is one of few remaining to this day. 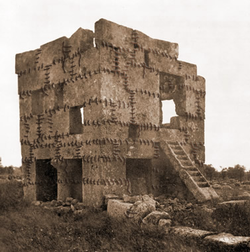 This stitched building in Syria is a wonderful example of stone stitchery, the particular art of which has largely died out since. As with many Roman innovations, it was largely forgotten in the Dark Ages, leaving citizens to find new and imaginative ways to fuse their clothing, household objects, houses, and livestock together. Many were forced to resort to the most primitive forms of glue, mud and manure, which has been theorised to be a factor in the spread of the Black Death. Sewing was briefly brought back in the Medieval period when armoured knights entered the fray. Fashionable in France in the 14th century, some entire suits of armour could be sewn together, but this resulted in a high casualty rate following the other European powers' usage of regiments armed with pins and needles. 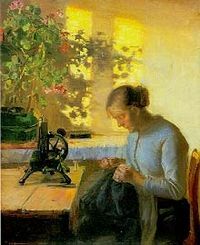 Sewing was again forgotten until the Renaissance, whereupon such famous artists such as Titian sewed together masterpiece paintings, a practice which has more recently resurfaced among Post-Modern artists, along with the practice of calling random objects art, dumping scrap metal on the lawn and calling it art, and lighting things on fire and calling that art. In the rise of gunpowder warfare, cannons originally had a tendency to split apart upon detonation before sewing allowed the barrels to remain encased in tight fusion. Though this solution remained highly susceptible to sabotage, the danger of that decreased since cannons could be made much larger because of the new connective techniques, enabling soldiers to place the larger and larger artillery further and further back. The trend of increasing cannon size continued until even the limits of sewing were surpassed and the largest cannon ever built exploded in the middle of Flanders. It wasn't until the 1800s and 1900s that the practise of sewing became widespread in the domestic sphere. Depictions in the blooming mass media helped spread popularity, and the Industrial Revolution brought thousands of workers into the field of sewing with the creation of mass-production sewing factories, creating clothes, toys, household items, weapons, and automobiles. Sewing continues to have many, many uses, from some less successful attempts to sew together conflicting neighbouring states and to sew fractured nations back together to the very effective endeavour enacted in the early 90s by the state of California to stabilise their faultlines, which, while costing the state billions of dollars to implement, saved them just as much in repair costs in the first two years alone. The unfortunate side effect this had of shifting the tectonic tension further south to Mexico and off the coast of South America was conveniently hushed up, and due to the other more pressing, pre-existing concerns faced by the countries now taking the brunt of the damage, largely ignored by them as well. A sewn bridge, designed to look pretty, crosses an expanse of dangerous water. Modern suspension bridges are a particularly common use of sewing, in which long spans of concrete act as thoroughfares, hanging suspended over expanses of water, city, and other thoroughfares by nothing more than a few interwoven strips of metal, unlike the older stone and wooden varieties in which the entire structure was safely knitted out of the given material. 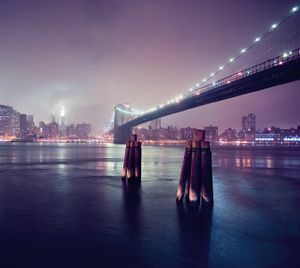 These bridges, while usually relatively strong and cheap, are most notable for just how spectacular their failures are when they fail. Buildings are also still often sewn, although gluing has since become more architecturally fashionable. Sewing has likewise fallen out of favour with doctors, opting to use glue in surgeries as well, but in this case it is more out of concern for the patient than for any stylistic purpose; glue is simply much less likely to result in a patient getting stabbed in the spleen with a needle. In science fiction, sewing is a commonly used tactic by many alien cultures, utilised not only in experiments on human subjects to fuse them with containers of juice, but also for much of their technology as a whole, probably for lack of any better ideas as to how beings from another planet would do things. In the popular sci-fi movie series Star Wars, Luke Skywalker has his hand severed by Darth Vader, for instance. In the following scene, he has a new hand sewn on by an extraordinary alien technology - the sewing machine. Likewise, sewing has made a constant appearance throughout the Star Trek saga, appearing not as a minor detail but as a primary mode of transportation, in which a particularly large sewing machine would first pick travellers apart at the seams and then sew them back together in another location, usually at the last possible moment. Classical, and more often pseudo-classical, literature also tends to feature sewing, not so much for its end results, but for its tendency to completely occupy women when they sew objects together by hand, a reportedly common pastime. It also has the convenient side effect of making for a decidedly boring read, since the act of describing sewing can fill up several paragraphs or even pages, and usually requires multiple highly detailed images to properly explain, thus preventing readers from getting into troublesome situations right along with the potentially unruly characters, as it is used as filler material while our handsome young protagonists are playing hard to get. Much as has been already predicted by modern science fiction, sewing has a very bright future ahead of it. There is potential for technologies as spacecraft, hovercraft (with and without eels), vacuum tubes like the ones found in Futurama, even space elevators, a proposed technology to cheaply and easily lift stuff, wanted and otherwise, out of the atmosphere through use of a long, woven carbon thread - a thread that not only is itself sewn, but of the sort that could be used for all manner of other applications. By far the strangest of these other applications involves one of the more disconcerting concerns for some theoretical physicists: the possibility that the very space-time of the universe may unravel. Not only does sharing this concern net them considerable income when those in charge of things grant them funds so they can try to fix the problem before it happens, but it has also created a new field, the realm of theoretical sewing. The idea is that if the physicists are granted enough funding, at some point they shall derive a method to literally sew space and time, thus averting catastrophe before it begins. Because of a recent relocation of the team to Aruba, news of their recent progress has been lacking, however. For the religious among us who choose to believe lies, the so-called experts at Wikipedia have an article about Sewing.